In 1492 when Columbus crossed the Atlantic, although latitude could be measured (typically from observations of the Pole Star), there was no reliable way of measuring a ship’s longitude once out of sight of land. Charts were inaccurate and incomplete and much of the World remained unexplored. As trade routes opened up, it became increasingly urgent to find a solution to the longitude problem. The maritime nations of Europe offered a variety of large rewards or prizes. Each 15° of longitude is equivalent to a difference in time of one hour. In theory then, in order to find out how far east or west he was from his homeland, all a sailor had to do was determine his local time from observations of the Sun or stars and compare it with the time back home at the same moment. How though, was a sailor in the 1500s supposed to know the time back home? The idea of taking a clock to sea had been considered, but even the best were too inaccurate to be of use. The improvements that came with the introduction of the pendulum clock in 1657 were substantial and revolutionised positional astronomy. However, on board a moving ship, a pendulum was found to beat irregularly and occasionally stop altogether. When measured against the background of stars, the Moon moves by approximately its own diameter in an easterly direction each hour. In 1514, Johann Werner of Nuremberg suggested using the Moon as an astronomical clock. At the time however, star charts were too inaccurate and the precise motion of the Moon and the effects of refraction by the Earth’s atmosphere were too poorly understood for it to be practicable. It was not until the invention of the telescope, the pendulum clock, the micrometer screw and logarithms in the seventeenth century that astronomers became equipped with the tools they needed in order to begin to turn Werner’s idea into a practical reality. Meanwhile, in 1610, not long after the invention of the telescope, Galileo discovered the four largest moons of Jupiter. He and others soon observed that eclipses of the moons occurred at what appeared to be regular intervals and suggested that the difference in time between the observed and predicted time of occurrence at a standard meridian would enable longitude differences to be measured. In 1616, Galileo submitted this method to the Spanish in an attempt to win their longitude award, but failed to persuade them of its merits. When the Dutch offered a longitude prize he turned to them but was again unsuccessful. Io, the innermost of the moons has an orbital period of about 1¾ days and Callisto, the outermost, a period of about 17. Through regular observation, Galileo gained a greater understanding of their motions and with this knowledge was able to improve his tables of predictions. As a means of finding longitude at sea, the method failed: not only did the telescopes prove impossible to use on a moving ship, but when Jupiter is close to the Sun, there is a period of about ten weeks when it becomes invisible. However, following the invention of the pendulum clock and the introduction of more accurate tables by the French astronomer Cassini in 1668, the method was widely used to improve maps and charts. The method remained in use until the start of the nineteenth century. In 1634, Cardinal Richelieu the King’s chief minister in France, set up a commission to examine a claim put forward by Jean-Baptiste Morin that he had discovered a way of finding longitude. What Morin proposed was a more refined form of what has become known as the lunar-distance method, previously proposed by Werner, taking into account both refraction and lunar parallax (a small shift in position that varies with the location of the observer). The Commission deemed that with the present state of tables of the Moon and stars, the method could not be used in practice. 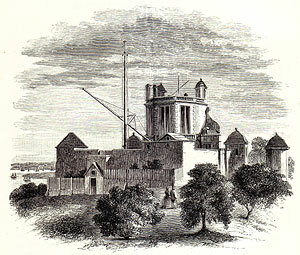 The Paris Observatory was founded in 1667 and not long after, in 1674, in the words of John Flamsteed, ‘An accident happened that hastened, if it did not occasion, the building of the [Greenwich] Observatory. A Frenchman, that called himself Le Sieur de St. Pierre, having some small skill in astronomy, and made an interest with a French lady, then in Favour at the Court, proposed no less than the discovery of Longitude.’ King Charles ll issued a warrant appointing a Royal Commission to examine the proposals. They too were based on the position of the Moon. 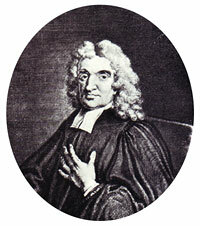 Flamsteed pointed out that for any method using the Moon to be successful, the position of the so-called ‘fixed stars’ relative to the Sun’s annual path needed to be known with greater accuracy, together with the ability to better predict the future position of the Moon relative to them. Based on his own observations, he had been able to show that the best available star catalogue, that of Tycho Brahe, was prone to errors, which meant that any longitude found could be in error by up to several hundred miles. To provide the necessary data, he said, would require years of observation with large instruments fitted with telescopic sights. On hearing this, the King appointed Flamsteed as his ‘Astronomical Observator’ with the instruction ‘to apply himself with the most exact Care and Diligence to the rectifying the Tables of the Motions of the Heavens, and the places of the fixed Stars, so as to find out the so much desired Longitude of Places for perfecting the art of Navigation.’ Three months later on 22 June 1675, he issued a further Warrant for the building of the Observatory at Greenwich. Flamsteed’s progress in rectifying the ‘positions of the stars’, a key pre-requisite for the lunar-distance method, was painfully slow. For the first 14 years, there was almost no progress, for although Flamsteed had been provided with a range of instruments; none was up to the job. It was only when he came into money following the death of his father that any real progress was made. With the help of his assistant, Abraham Sharp, he constructed his ‘much-desired’ mural arc. The first recorded observation was taken in 1689 and the last shortly before he died in 1719. With it, he obtained most of the data needed for his catalogue of 2,935 stars, which was published posthumously in 1725. Although errors were subsequently discovered, it was of sufficient accuracy to be of use to those seeking to navigate by the lunar-distance method. Still required though was the invention of a suitable instrument for measuring the Moon’s position whilst at sea and the rectification of the motions of the Sun and the Moon. With the lunar-distance method still far from being perfected, the British Government in 1714, set up the Board of Longitude. 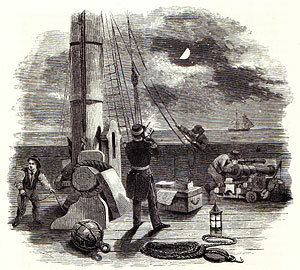 It offered a reward to anyone who could find a means of measuring longitude at sea: ‘a Reward of Sum of Ten thousand Pounds, if it Determines the said Longitude to One Degree of a great Circle, or Sixty Geographical Miles: to Fifteen thousand Pounds, if it Determines the same to Two Thirds of that Distance, and to Twenty Thousand Pounds, if it Determines the same to One half of the same Distance’. It was also empowered to offer smaller sums for less accurate methods and to spend up to £2,000 on experiments deemed likely to yield useful results. 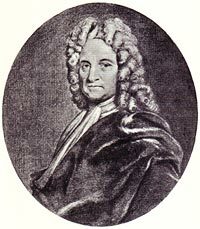 Flamsteed’s successor, Edmond Halley, concentrated on observing the Moon. The interplay of the gravitational forces on the Moon from the Earth and the Sun causes irregularities in the Moon’s orbit. The pull of the Sun speeds the Moon as it moves towards it and slows it as it moves away. Although the Moon comes back to approximately the same position in the sky from one month to the next, the exact path it follows varies. Try as they might, astronomers and mathematicians had been unable to adequately model the orbit. Halley therefore decided to observe the Moon over the period of a complete Saros cycle, a little over 18 years and the time taken for the Earth Sun and Moon to return to approximately the same geometry, and use this data to create his lunar tables. When the tables were eventually published, observations proved his predictions to be incorrect. 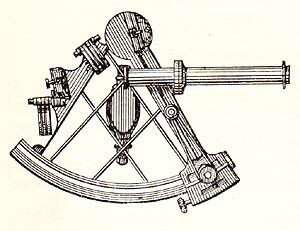 Meanwhile, in 1731, John Hadley had invented the reflecting quadrant, the first instrument capable of making the angular measurements on board ship with sufficient accuracy for the lunar-distance method to work. Although it was a key development, Hadley was not eligible to claim a reward from the Board of Longitude under the terms of the act. It was a few years later in 1737 that the Board gave its first award. This was to John Harrison, who was awarded £250 ‘for enabling him to make an Experiment of a Machine invented by him in the nature of a Clock Work to keep Time at Sea and to make another of the same Nature but smaller Dimensions’. Spurred on by various prizes offered by the Academy of St Petersburg in the early 1750s, mathematicians and astronomers on the continent published new lunar theories and tables. In the end, it was Tobias Mayer, who was the first to produce a set of tables of sufficient accuracy for lunar-distances to be derived. Compiled from Euler’s equations and from his own and Bradley’s observations at Greenwich, they were published in 1753. Mayer was encouraged by Euler to apply for a reward from the Board of Longitude. In 1755, he sent a copy of the tables to Admiral Lord Anson, First Lord of the Admiralty and President of the Board, along with a model of a portable instrument of his own design. The results of the sea trials conducted on the Board’s behalf by Captain John Campbell were inconclusive. Mayer’s observing instrument was heavy and unwieldy, but did have a number of advantages over the Hadley Quadrant. Campbell incorporated these along with the best elements of the Quadrant into a new instrument, the marine sextant that he went on to develop with the instrument maker John Bird. In the same year that Mayer’s tables were published, the French astronomer Lacaille became the first person to use lunar-distances successfully at sea when he used his own lunar tables on a journey from the Cape of Good Hope to France. His methods were later explained by Lalande in the edition of the French Almanac Connaissance des Temps published for the year 1761. It contained diagrams for graphical solutions and tables of pre-computed lunar-distances every four hours for the month of July. Mayer’s tables were tested by Maskelyne on his voyage to observe the 1762 Transit of Venus in St Helena. He also took with him a copy of the Connaissance des Temps. Having achieved an accuracy of generally better than 1°, on his return he published the British Mariner’s Guide, which incorporated Mayer’s tables and explained how to use the method at sea. The method though remained impractical for all but a handful of people due to the complexity of the calculations required, Maskelyne himself having taken up to four hours to complete them. While all this was going on, John Harrison, after over 20 years of trying, had finally managed to build a timekeeper that he believed would keep good time at sea and win him the much-desired longitude prize. Now called H4, it was first tested on board ship in 1761. A second sea trial took place in 1764, with Maskelyne being sent on ahead to settle the longitude of Barbados from observations of Jupiter’s satellites. Shortly before he died in 1762, Mayer had prepared a more accurate set of tables, which his widow subsequently sent on to the Board of Longitude who arranged for them to be tested by Maskelyne on the same Barbados trip. 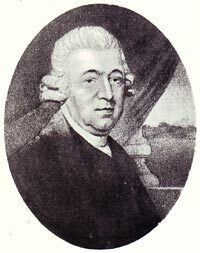 In February 1765, Maskelyne became the fifth Astronomer Royal. 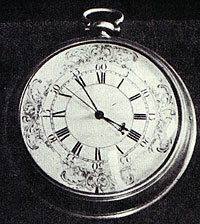 Shortly afterwards a new Longitude Act was passed which changed the way in which the longitude prize was to be awarded. In May 1765, the Board awarded Mayer’s widow £3,000 for the lunar tables and Euler £300 for ‘Theorems furnished by him to assist Professor Mayer in the construction of lunar tables upon the Principles of Gravitation laid down by Sir Isaac Newton.’ Later that year, Harrison was awarded £7,500, taking the total amount he had by then received for the completed H4 to £10,000. In 1767, the lunar-distance method became a reality with the publication by Maskelyne of the first Nautical Almanac. 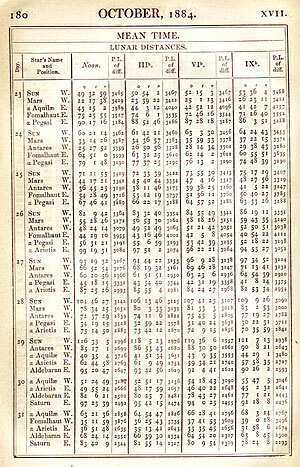 It contained a set of tables showing the position of the Moon during 1767. The Moon’s angular position relative to nearby bright stars was listed at three-hourly intervals of Greenwich time. For both this and the subsequent nine editions, the lunar positions were computed from Mayer's tables. To determine his longitude, a sailor had to measure the angle between the centre of the Moon and a listed star (the lunar-distance) along with both their altitudes. Next, he had to calculate his own local time and correct the Moon’s position for the twin effects of parallax and refraction. The time this corresponded to at Greenwich was then determined from the Nautical Almanac. From the difference between this and his local time, he was able to calculate his difference in longitude from the Meridian of the Royal Observatory at Greenwich. To make the whole process as simple as possible, Maskelyne simultaneously published the Tables Requisite. It contained, amongst other things, tables to correct for the effects of refraction and parallax, together with instructions and worked examples of how to use them. Thus the 1760s marked an important turning point in navigation. After years of uncertainty about their longitude at sea, sailors now had two ways of measuring it. Both methods worked by measuring time differences. The lunar-distance method, using a sextant and the Nautical Almanac, gave time differences (and hence longitude differences) from Greenwich. On the other hand, mechanical timekeepers, or marine chronometers as they came to be called, allowed the time difference from any chosen town or city to be measured directly. 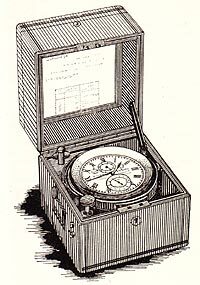 Whilst supplies of quadrants, sextants and almanacs were readily and cheaply available from the start, chronometers were initially both expensive and scarce. It took until the 1820s for supply to catch up with demand and by that time, their price had fallen to a more affordable level. The almanac was adopted by many countries. As a result, when the International Meridian Conference met in 1884 to settle on a Prime Meridian for the world, more sailors were measuring their longitude from Greenwich than anywhere else. When the vote came on the resolution: ‘That the Conference proposes to the Governments here represented the adoption of the meridian passing through the centre of the transit instrument at the Observatory of Greenwich as the initial meridian for longitude’, it was adopted with 22 governments supporting it, one opposing and two abstaining. The heyday for the lunar-distance method was from 1780 until 1840 when the use of chronometers became much more commonplace. The last lunar-distance tables to be published in the Nautical Almanac were in the edition for 1906. Sailors today use GPS, a precision navigation system originally developed by the USA for military purposes. The key components are a suite of satellites circling the Earth in well-defined orbits along with a network of ground stations. The satellites are arranged in six orbital planes with four satellites in each. At least four are always ‘visible’ from anywhere on Earth. The satellites transmit low power radio time signals. The receiver calculates the distance to each based on the time delay in receiving the signal and uses the information to calculate its own location. To do this, the receiver has to know exactly where the satellites are at that precise moment. This information is stored in the receiver’s memory. The US Department of Defence monitors the exact position of each satellite from ground stations and transmits updates as part of each satellite’s signal.